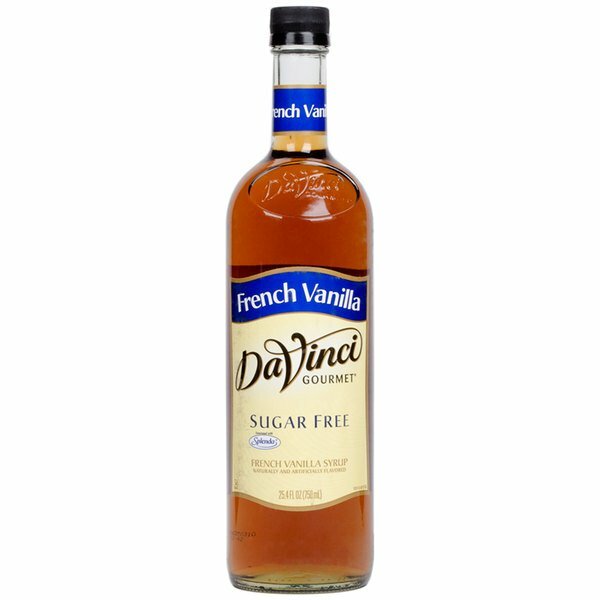 This user-friendly bottle of DaVinci Gourmet sugar free French vanilla flavoring syrup allows your busy baristas to quickly and easily serve up delicious hot, cold, or blended drinks with irresistible flavor without the sugar content! DaVinci Gourmet flavoring syrups complement your beverages without overpowering them or being too sweet. They are specially formulated to resist curdling in milk and hold up well under heat, making them the perfect choice for espresso-based drinks, brewed coffee or tea, and more. Add a rich, custardy flavoring to any drink with this DaVinci Gourmet sugar free French vanilla coffee flavoring syrup! Compared to regular vanilla, French vanilla has a particularly smooth and creamy flavor. Use it for sweet frappes, cupcake batter, and you can also use it to make whipped cream that floats atop your coffee beverages. Sweetened with sugar free, no-calorie Splenda Brand Sweetener, this sugar free blend is sure to be a treat for your health-conscious patrons! Splenda tastes like sugar, giving you great flavor without the calories. 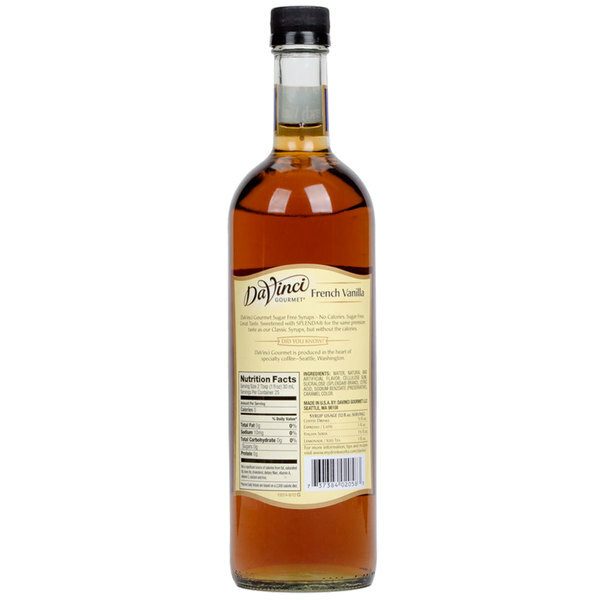 Sold in gourmet coffee shops, specialty food stores, food service outlets, and grocery stores, DaVinci Gourmet products, like this sugar free French vanilla flavoring syrup, have a long history of commitment to quality and superior taste. Great price for the best coffee syrup around. It is fantastic in both hot coffee lattes as well as iced coffees. For the price, this is the best coffee syrup on the market. The French vanilla has a richer flavour compared to standard vanilla. The taste is a little alcoholic, would make a lovely vanilla custard or dessert. The sugar free French Vanilla syrup is excellent and makes a great tasting latte or café latte. The sugar free version is just as good as the original. Love the great taste of French Vanilla. The French vanilla is a little bit harder to find... when I was looking for syrups, all I could find was classic vanilla. Webstaurant has some great flavor choices and the sugar free option is perfect for some of the customers! Even without the sugar, it tastes great!! French vanilla is amazing no matter what it is in. This happens to be what I use to flavor my coffee with now because it doesn't leave a bad aftertaste like some other brands do. A nice style sugar free coffee flavoring syrup that tastes just like the original French Vanilla syrup. The syrup is great for making delicious cold brew coffees. Peppermint Paddy is amazing. You can actually taste the hint of chocolate. Works great in lattes, frappuccinos, and hot chocolate. Webstuarantstore delivery is prompt and no broken bottles. I really like this sugar free coffee syrup for its rich flavor and pungent smell. The syrup makes a wonderful addition to our crème brulee batter. It is also perfect for a French vanilla cappuccino. Da Vinci gourmet sugar free French vanilla syrup with Splenda is amazing! Now I can enjoy my hot, iced, or frozen coffee without the added calories, sugar! Love all of theses syrups but, the sugar free ones don't bake well!! We use theses flavoring so in our homemade pound cakes, cookies, amid muffins!! Baking is all about chemistry, might be the fact that there's artifical sugar in them, just doesn't seem to come out as well!! French vanilla has that pronounced vanilla taste. This one was enjoyed in and on everything. It is a popular flavor among diabetics because it is a common flavor. I dislike splenda. In typical DaVinci fashion, this product is exceptionally flavored without too much artificial sweetener. This particular syrup - the sugar free french vanilla syrup - is rich and complex without being heavy. It has a deep, warm scent and imparts a picture-perfect french vanilla flavor without the calories. It won't over-sweeten your coffee drink, don't worry! This classic flavor is used for just about anything you can think of. We use it for desserts, coffee drinks and other beverages. Always keep extra on hand. Great price on this syrup--speaking of the French Vanilla Sugar Free flavor. I also love that there are no calories in the sugar free/Splenda flavors! Other than the very mild sweetener flavor which happens with all sugar free products, you really can't tell the difference in the sugar free french vanilla and the regular. We go through a lot of these and will keep them permanently. add this too my coffee and oatmeal in the morning as it is sugar free, ice cream also! nice flavor! love the way it came packaged! It is the first time I buy these flavor. I did not like the taste , it tastes like pure alcohol. I recommend better to use natural products instead of syrups to flavor your drinks . DaVinci does it again! This is one of the best French Vanilla syrups i have ever tried. Not overly sweet but full of rich creamy vanilla flavor. Excellent in your coffee or your morning mug of caramel macchiatto. Save Up To $0.30 with our Recommended Product! 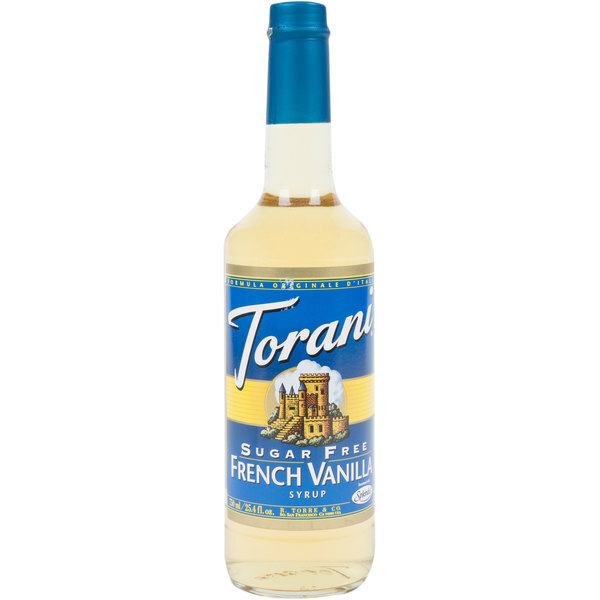 Try this Torani 750 mL sugar free french vanilla flavoring syrup instead! Torani flavoring syrups are specially formulated to resist curdling in milk and to hold up well under heat, making them the perfect choice for espresso-based drinks, brewed coffee or tea, and more. This is a perfect alternative while the DaVinci Gourmet 750 mL sugar free french vanilla flavoring syrup is temporarily out of stock!